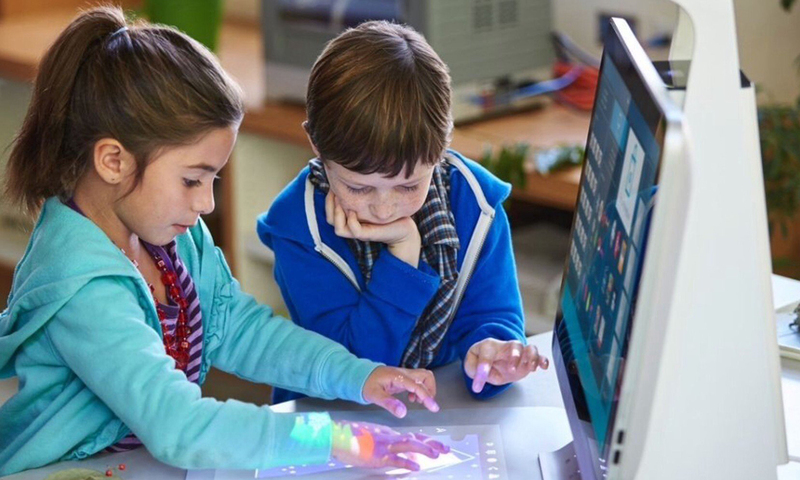 The KIC kiosk with the Sprout Pro by HP is an exciting new addition to the KIC family. 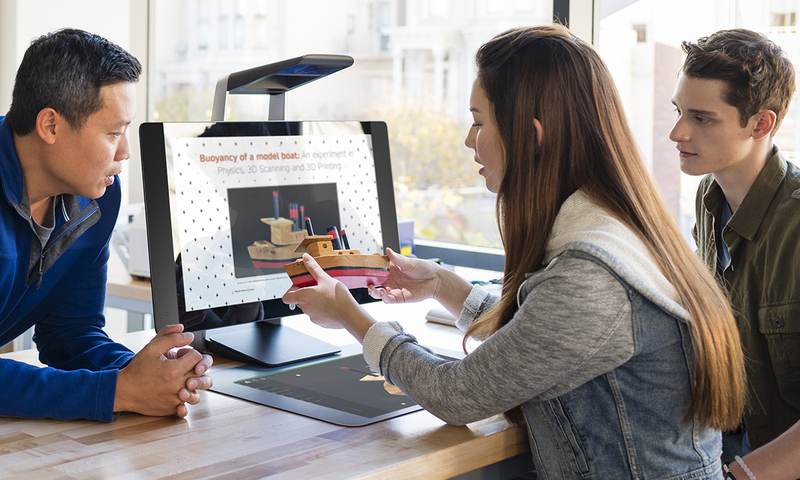 With its state-of-the- art immersive and 3D scanning capabilities, Sprout Pro makes a great KIC system that is the most versatile in the KIC family. 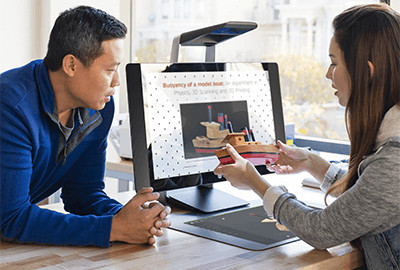 Its face up full-color scanning capability is easier to use than face down scanners and copiers. It’s easy on book spines, too. For student patrons, enhanced reading retention and learning effectiveness and efficiency up to 20% ! 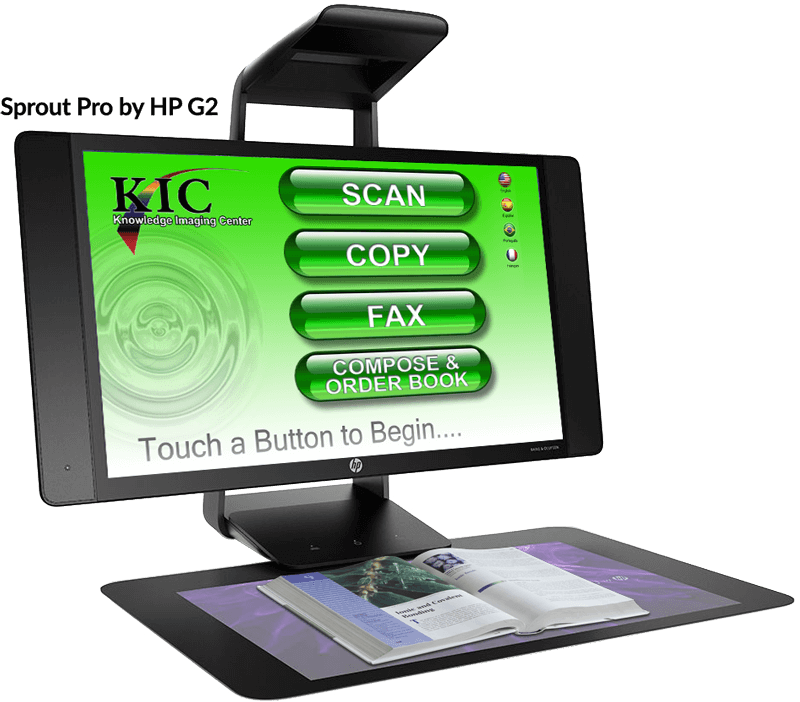 With its copier replacement option (a fast duplex paper scanner, fee collection support and special user interface), KIC for Sprout Pro replaces multifunction copiers with 21st century hybrid library technology. Scanning with KIC is very visual and easy. 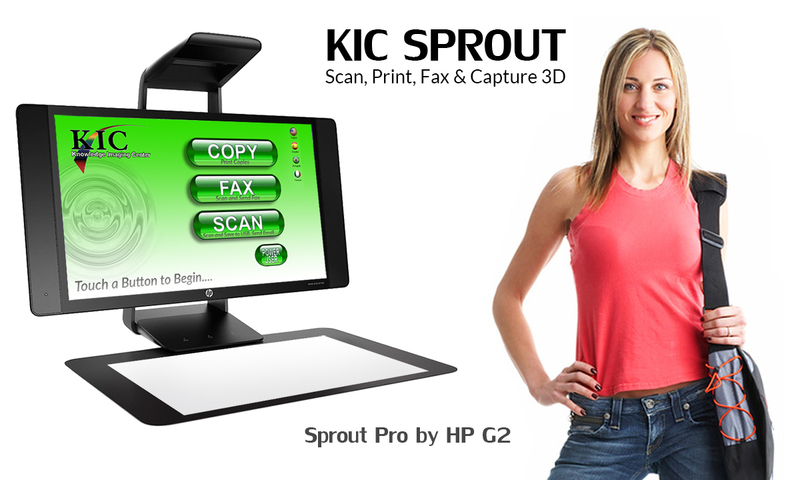 Unlike face down copiers and flatbed scanners, KIC for Sprout Pro offers face up scanning, which lets users see what is being scanned. After they scan, the images appear on the large (23.8” diagonal) screen. Before saving, emailing, printing or faxing, users know without doubt what they will get. In fact, if the user sees a problem, the page can either be rescanned or corrected using KIC’s easy to control image editing features. It’s large touch screen also makes operating KIC much easier than operating a copier. In stark contrast, copiers have tiny control/view screens. Where do the electronic documents and pictures that are scanned go? 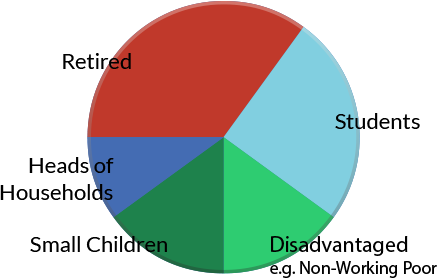 tablets and computers, or saved to cloud storage services. They can also be emailed. 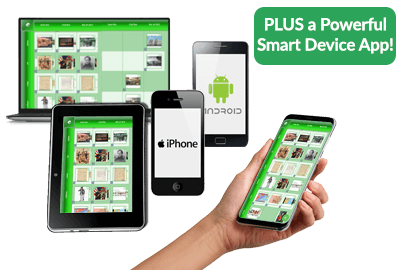 A smart phone is a very convenient place to store important documents because your patrons will always have all of their documents with them, and because the documents can easily be viewed on their smart phone screen. And if they have USB flash drive or cloud backup for their phone’s content, they can even lose their phone and their documents will be safe. Most people over 40 years of age have collections of photo prints. This represents a very large percentage of the families in most communities in America, and most likely in your library’s community as well. 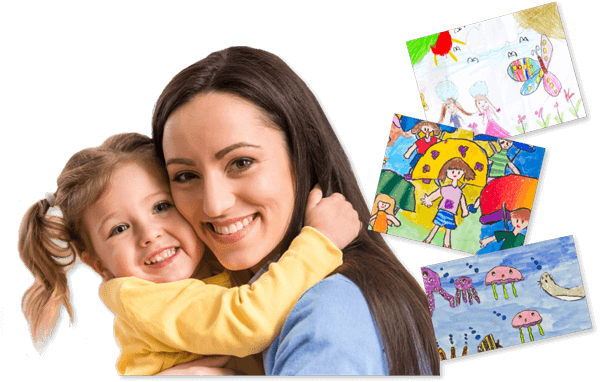 In the digital age, it is compelling to have digital copies of these photos, and of children’s art and other special materials like family recipes. Note that KIC with Sprout Pro can scan up to 11x17 inch materials. Copiers don’t need a big screen. The digital age is different. When documents become electronic, a big screen is needed to see them clearly. Even when scanning to simply fax, email or save the documents, it is very helpful to be able to see big, clear images of the electronic pages before faxing, emailing or saving them – there is always a chance that you didn’t scan exactly as intended. Note that while a large screen is important, all of the other features of KIC make a compelling argument for eliminating all copiers from the library floors and placing a KIC everywhere a copier once was. 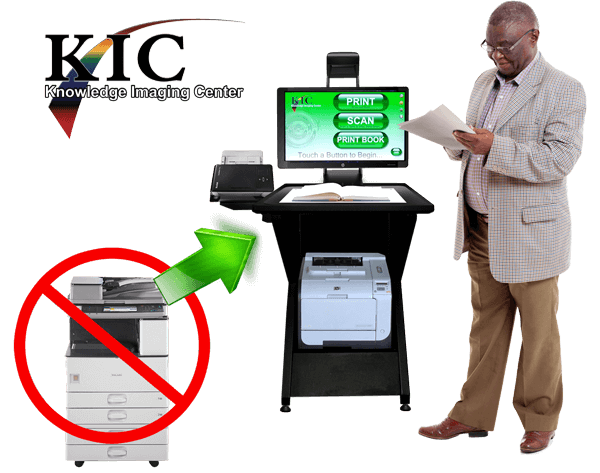 And the total cost of KIC is typically less than the total cost of the copiers that it replaces. 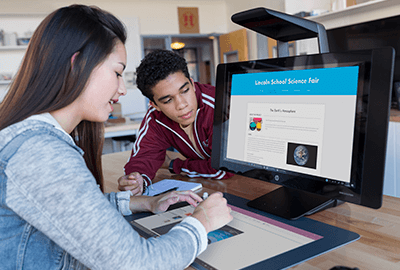 Your student patrons can scan their study materials with KIC, select text, pictures and graphics that they need to review, and KIC will create a PDF file of the selected content, plus an audio file (MP3) of the selected text. Highlighted text can automatically be selected as well. With MyDocs, users can find, view, email, print and fax directly from their phone with only a few swipes and touches. 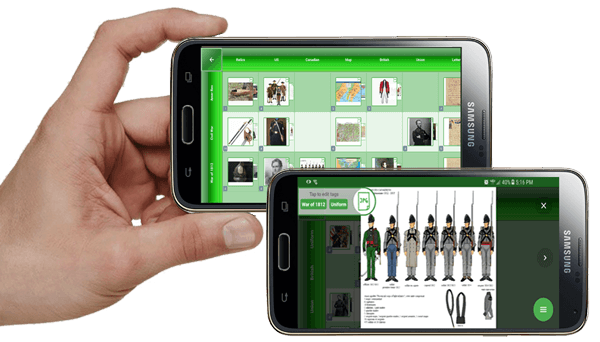 MyDocs also supports RSVP speed reading and lets students create flashcards from content scanned on the KIC system. 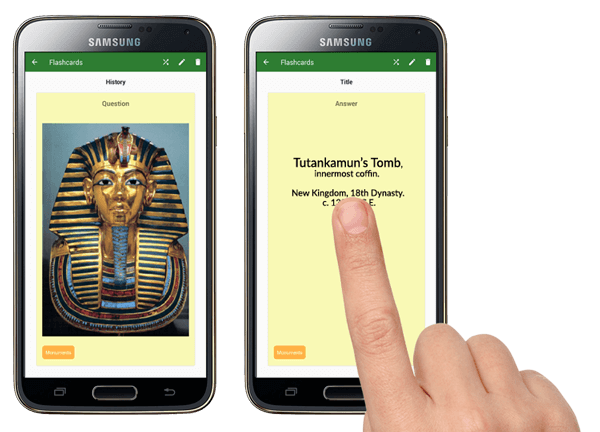 Using a KIC system, students can scan their textbook pages and in MyDocs, create flash cards from content that meets their specific study needs. When used together, MyDocs’ three main learning enhancement tools can dramatically improve the learning efficiency and effectiveness of a study session. Students can get a quick overview with RSVP speed reading, then use ReadAlong Audio for maximum retention, while pausing as needed to create flash cards for information bits that need further review and could be on a test. After finishing ReadAlong Audio, the student can practice and memorize with his personalized flash cards. Dividing studying into three very different parts also keeps study sessions lively and dynamic, and avoids the doldrums, which can waste a lot of study time. 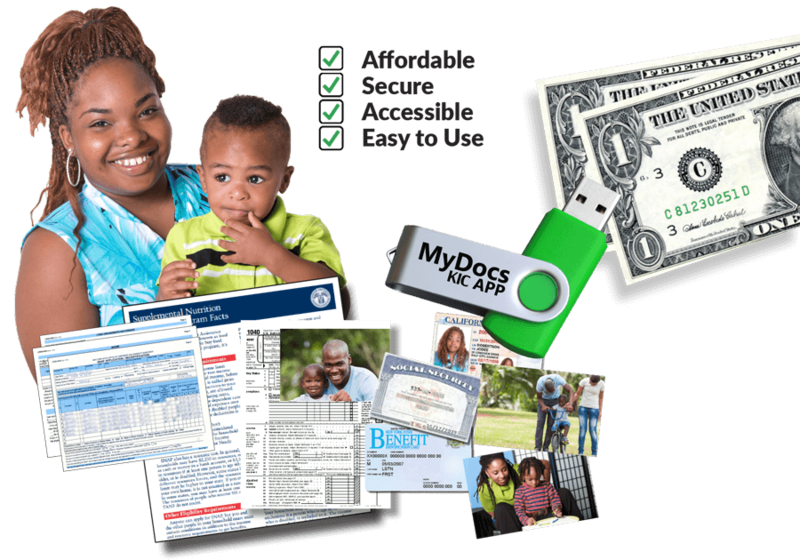 With the touch of a button, all this can be transferred to MyDocs on their smart phone. Students can then listen to the audio of their review text while reading along - hearing while reading has been proven to substantially improve retention. Having KIC in your library can substantially improve the quality of education for your student patrons. Read Along Audio lets students read text with synchronized audio playback of the text - great for retention. Note: Sprout Pro by HP 3D Camera app has some limitaitons, and not all objects can be scanned. $2 flash memory devices are now available at drug stores, convenience stores, even gas stations, making it affordable for virtually anyone to maintain multiple copies of all of their documents. Electronic documents on flash memory devices can be viewed and, if desired, printed, using PCs at your library or using tablets at your patrons’ homes. 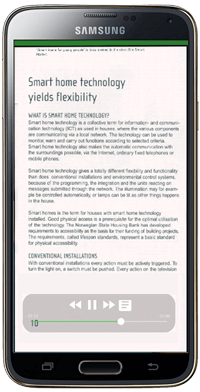 Even most smart phones can display documents stored in flash memory devices. Don’t throw away your family’s precious mementos! Store them all with less effort and next to no expense. Save them digitally, print a coffee table book that will preserve your family memories and spark conversations about the history, information, and wisdom that your family has collected over generations. 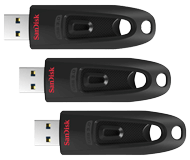 With USB flash drives or cloud storage, losing your phone does not mean losing your documents. 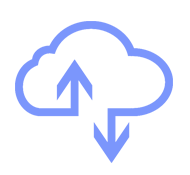 Some cloud storage services are even free. MyDocs even has an archive feature for letting users create multiple, secure copies. 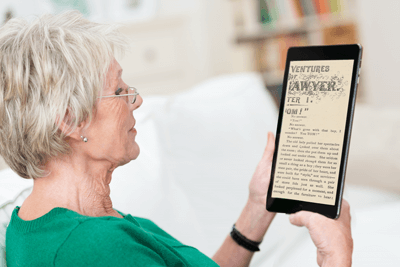 Patrons that have trouble reading the small text in typical books, magazines and newspapers appreciate the ability to enlarge the digital text produced by KIC. KIC for Sprout Pro can be purchased separately or with KIC in a discounted bundle from the Digital Library Systems Group. iPhone is the legal copyright of Apple Inc.